Hunting PLC has announced the finalists for their prestigious annual competition, The Hunting Art Prize 2009, which awards $50,000 to one distinguished artist. 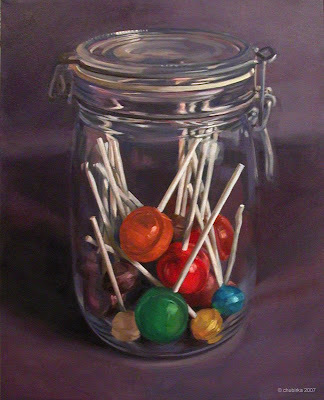 Included as one of the 134 finalists was Jacqueline Chubirka's oil painting "Tootsie roll pops," a consummate example of her work in modern realism. The Hunting Art Prize is the most generous annual art prize in the U.S., intended to help the reputations, raise the profiles, and support the careers of distinguished artists. In April, a second panel of jurors will make their decision. On May 2, the prize will be awarded, and the art will be exhibited at a gala held at the Decorative Center in Houston. "Tootsie roll pops", 20x16 oil on canvas.